I simply can NOT say enough good stuff about this salad! In fact, what little was left over after dinner, I just finished off, scooping it up as a dip with tortilla chips! It was my daughter’s first time trying avocado and she loved it as much as me! My husband is not an avocado fan, so he ate around the avocado, but hey, more for ME!!!! I will be making this again and again, because it is a delicious, EASY, and HEALTHY side! 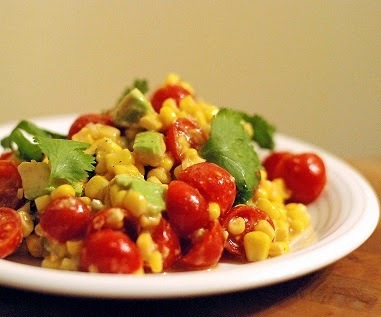 Mix together corn, tomatoes, avocado, and cilantro. Whisk together lime juice, olive oil, and garlic; season with salt and pepper to taste. Pour dressing over corn mixture, and toss to combine. Refrigerate at least 15 minutes.